I previously experienced Jiufen during the day. 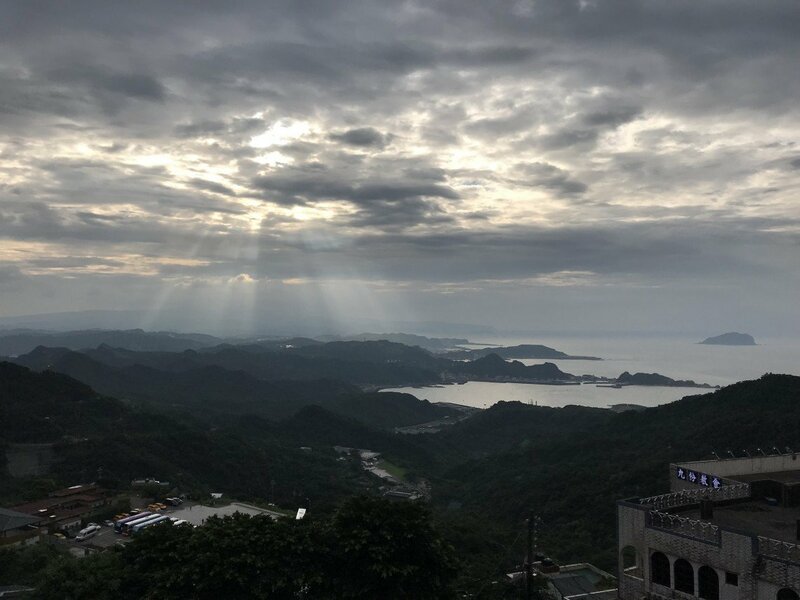 It was fun to look out towards Keelung City (基隆市 / ji long shi) and the rest of the northern part of Taiwan from the various vista points. The many travel blogs I had seen about Jiufen (九份 / jiu fen) though, showed a vastly different look at night. I knew I wanted to come back to see the old street transform. After launching sky lanterns in Shifen (十分), I got my chance to see what Jiufen looked like at night. Venturing through the narrow corridors of Jiufen, save for a stores here and there that were closed, mostly it was business as normal. There were around the same number of people walking around, taking a look at the different shops. I captured more video which I set to music. Hopefully it gives you a feel for what you can see and experience in Jiufen. On the way to the very end of the walking path, we made a stop at Grandma Lai’s Taro Ball (賴阿婆芋圓 / lai a po yu yuan). 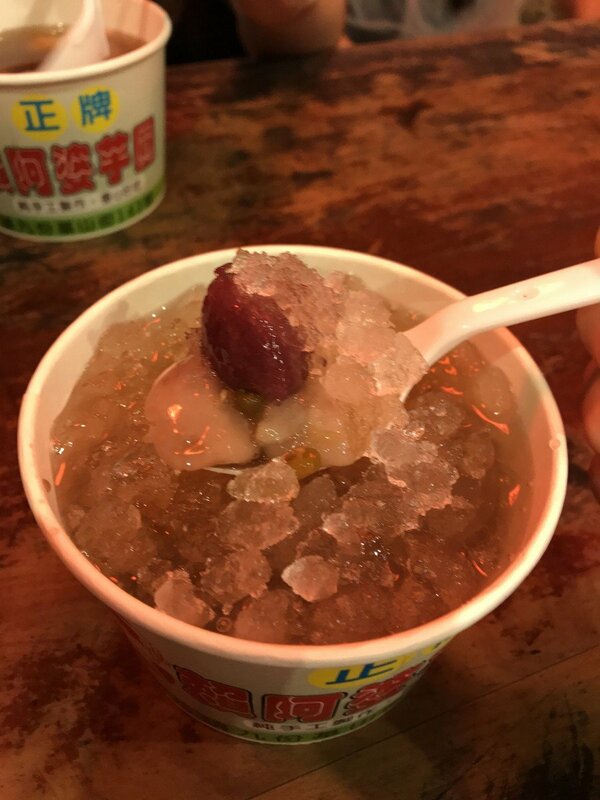 The sweet soupy dessert contains taro balls and beans under a refreshing layer of crushed ice. As it was pretty hot outside, it was a nice way to cool down for a bit. Eventually we made it to the end of the main path. With the sun setting on the horizon, we made our way to Amei Teahouse. 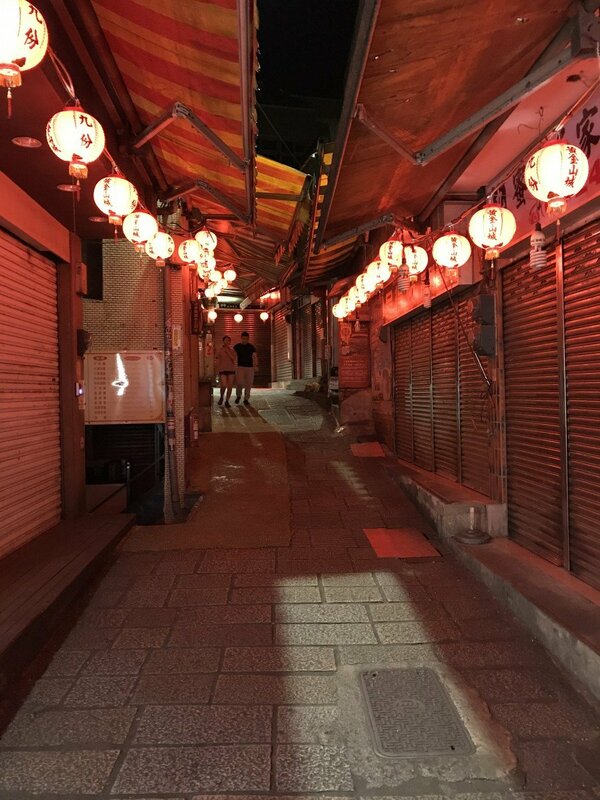 The lanterns along the pathway lit up, casting the ground in redish light. When we got to the tea house, the building was impressive. It was lit, not only with similar red lanterns everywhere, but large lights showcasing the huge masks adorning the exterior. Within an hour of it getting dark and the lanterns turning on, much of Jiufen was empty. Most of the shops were closed and most of the paths looked like what you see below. What was, perhaps, magical, was now actually kind of eerie. It was nice though seeing the contrast and being able to enjoy walking around without the hustle and bustle of people. Though I wish stores stayed open a little while longer to allow guests to take advantage of the cool ambiance, I did enjoy wandering around the empty pathways at night. If you were to ask me what time is best to go, I would say, work back from sunset, planning all of the things you might be interested in doing. This way, you get to do most everything you want to do in Jiufen with the added benefit of seeing the place aglow at night—after all, even if it wasn’t the inspiration for Spirited Away, it’s still quite a magical place to walk around. The post Wandering the Corridors of Jiufen at Night appeared first on Collecting EXP.